When will Final Cut Pro X actually be final? Apparently, launching the Apple Watch and new Macbook this week wasn't enough for the world's biggest technology company. 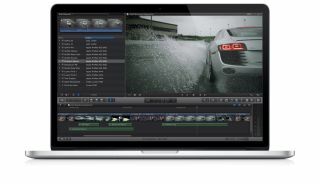 Today, Apple has announced an update to its Final Cut Pro X, Motion and Compressor apps. Pushing Final Cut Pro X to version 10.2, the new update delivers easy to control 3D motion titles improved masking for colour grading and effects, and native support for more camera formats. Meanwhile the updates to the Motion app allow users to create custom materials and environments for 3D titles and share them to the main Final Cut Pro X app, and the Compressor updates make it easy for filmmakers to publish to iTunes. The update is available to filmmakers now, with owners of previous versions of Final Cut Pro X getting the upgrades for free. New customers can grab Final Cut Pro X 10.2, Motion 5.2 and Compressor 4.2 from the Mac App Store for a recommended retail price of $US300 / £230 / $AU380, $US50 / £40 / $AU65, and $US50 / £40 / $AU65 respectively.